AR	Starting at the beginning, can you tell me, what was the first visual object that you remember, or that influenced you in some way? AK	Don’t! Are you talking about art, or just thinking back to childhood and growing up? I suppose the first thing that comes to mind is my mother’s breast. AR	That’s probably an invented memory! AR	But are there things in your childhood, growing up in India, that you remember in the background, even subliminally? Did you visit places with your family? AK	Well, other than the Prince of Wales Museum in Bombay (as it was then), there were almost no places to visit. There were the Elephanta Caves, and there were temples, but we didn’t really visit temples because my parents weren’t religious, although I was aware that there was an important temple not far from where we lived. I went to it, went around it, went close to it. The Prince of Wales Museum, especially in the late 1960s was absolutely dead. There were a few things very mustily shown, but it was almost as if in India, post-Independence, the museums were trying to form an idea of what an Indian visual context might be, but it was full of clichés – clichés that we’ve bought into. GH	So how did you go the Prince of Wales Museum? Did you choose to go, or did your parents take you, or school? AK	I’m sure we were taken – school and parents and so on. But I would much rather go the Eros Cinema and see the latest Bond movie of course! GH	You mentioned the Elephanta caves, and this show is really interesting because it brings your work into proximity in Mumbai with the caves, and in Delhi with the Jantar Mantar Park, which is also a special place for you. Can you say something about these two places and their significance for you? AK	It wasn’t really until I left India and lived here that they became special – maybe it always works like that, that one forms a mythological vision of some kind where those things become important. And of course Elephanta, the very fact of those caves: so much of my work has been about excavation and I see the whole process as being archaeological in a sense, hopefully excavated out of the subconscious as much as it is literally out of the stone. So the whole thing of the form turning inside out has got to do with cave and cave technology; and with darkness and the whole notion of a journey inwards, backwards, both psychologically and philosophically. So, yes, the caves are incredibly potent. GH	Did you visit the caves when you were living in India? AK	I did, but only as a child. On some subconscious level the caves remain in your mind. It’s not incidental that EM Forster used the caves as a metaphor for that dark, mysterious interior of India. I think it’s a very powerful emblem. There is something at least about the India I knew as a child – perhaps it’s less true today, but I don’t think I’m just talking about me – that remains profoundly unknowable, even in the imagination. There’s a sense that there’s always an India that you can’t reach, that you don’t know – it’s more mysterious, it’s deeper and darker – and that’s an image that has somehow lingered. I think it’s a curious truth about a culture that’s so complex, at many different levels. I remember Jantar Mantar from later on. I was probably fourteen or fifteen when I saw it for the first time and I remember being mystified by these very strange objects. Throughout the period that I was making pigment pieces it featured pretty significantly in my visual language because they seemed to form, I suppose, objects that relate to the sky. They are fundamentally observatories, rather like Stonehenge, or New Grange in Ireland. There are a few of these primal places – standing stones and others – that do one of the very fundamental things that sculpture can do outside, which is to express the relationship between things that are properly on the ground to something cosmic. 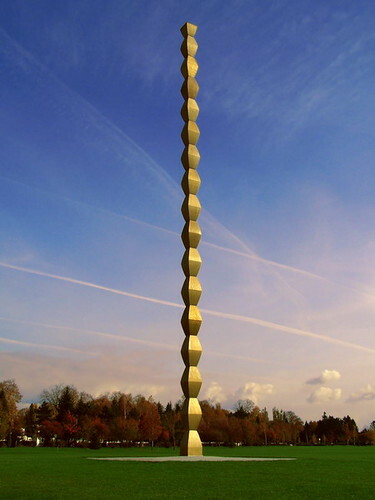 I’m thinking of course of Brancusi’s Endless Column [Targu Jiu, Romania]. GH	From Jantar Mantar there’s obviously a formal, morphic connection with your own pigment pieces; but it’s interesting, as you say, that it’s an astronomical site. More recently, your work has been addressing questions of bigger perception and optics, which I suppose are a secondary connection to that site. AK	It’s interesting how Jantar Mantar forms itself. There are steps that apparently go nowhere, leading up into the sky, but not ending anywhere, so there’s an Escher-like quality to the place. There are bowls that seem to be the opposite – or the reflection of – the dome of the sky, but they are mathematical so there’s that formal correlation, but also the idea that one can understand the universe mathematically. And then in Delhi – I think it’s wonderful – there’s the Sri Yantra , which is a kind of yonic image. It’s like two halves of an apple, with steps coming down the side of it. It’s as if in the relationship between geometry and cosmos there’s a very real sexual, human element. At least, that’s how I looked at it, and always felt it to be poignant. AR	And when you first came to England, such a different context, what did you feel about it? AK	The more I think about it, of course in many ways it’s very similar to India. And yet it was completely different – couldn’t have been more different. AR	You had been studying engineering before. What made you decide to study art here? AK	I was at engineering school in Israel. I wasn’t happy. It’s not what I wanted to do, and I wasn’t very good at mathematics. So I quit after six months. AR	Did you know at that stage that you wanted to study art? AK	Not immediately, although I’d formulated it within two to three months, so I suppose it was pretty quick. And then I had a real sense of certainty about it, almost immediately. AR	Was this when you had started at art school in England? AK	No, before, in Israel. It took me a year or so to get my act together. AR	You were quite young: seventeen at the time? AK	Eighteen. As I say, it took a while for me to get my act together, but then I knew exactly what I wanted to do. GH	Did you have a role model, or an idea of what an artist was? AK	No, I had no idea of what artists do, or how, or anything. You know, we hadn’t looked at much art. We’d been to the sites of course, and my uncle collected a few Indian artists such as MF Hussain, Krishen Khanna , and a few others. But there were no artists in our family or anything like that. AR	Your father was a water engineer – was there some sort of causal link between what you do and his work? AK	He was a hydrographer – an ocean map-maker. He spent his life plumbing the depths and exploring the dark ocean; I suppose there must be a connection of sorts. AR	Which would you consider to be your first ‘real’ work of art? AK	It’s very hard, that one. I’ve often cited that a chalk drawing on the floor, made in 1971, a few months after I started at art school. It’s not uninfluenced by what was going on around me, from Paul Neagu [the Romanian-born sculptor was a lecturer at Hornsey College of Art] to Beuys, and to a reading of Marcel Duchamp. GH	It’s interesting that your first work should be a diagram rather than an object. AK	I suppose I didn’t know how to make an object. But all the works after that are three-dimensional, and they were all ritual objects of some kind or other. AR	Is that before you’d been back to India? AK	Yes. You know in a way I didn’t think of myself as Indian. In those days it was a different context. In the early 1970s you were an artist. AR	You didn’t think of yourself as Indian? AR	Were you taken aback? AK	I was rather, because it didn’t seem relevant. The march that I saw as relevant was the march of artists I was interested in, from Joseph Beuys to Donald Judd . GH	That must have been a very rapid learning curve, from a teenage background where you weren’t exposed to that kind of work. AK	Yes, it felt as if it were a time to take in and learn, but then art students are pretty stupid on the whole – sorry art students! And one learns, almost irrespective of the milieu in which one grows up. On the other hand, my parents were sophisticated and cosmopolitan. AR	Had you ever visited England as a child? AK	No, we travelled, but not outside India. Although we didn’t go much to the theatre, there was a cultural context in Bombay – reading, music, and all that was very much part of our growing up. There were also some perfunctory art books. You can look at a work in a book, so I knew Pollock, but I’d never seen one. GH	The exhibition at the NGMA in Delhi includes a few examples of your pigment pieces – some of your earliest mature work – which are extremely well known. In a way, it’s rather a shame that we haven’t been able to include some of the more recent cement pieces, shown so beautifully at the Royal Academy of Arts in London last year, because they seem to pick up on something in those early works – this repeated iteration of a single, formal idea that has an endless variety of forms. How do you see the relation between these two groups of work? AK	Whenever I have a difficulty, I always go back to the pigment pieces. I always look at them again. When I was making them, I felt more alive than I’d perhaps ever been in my life, in the sense that it was a daily invention. At that moment, I had no idea where they were coming from. It’s as if something opened in me and these things were just pouring out – it was great, wonderful; it was terribly exciting. I’m talking, in a way, about a state of mind, a state of being. I’m trying to keep going, to go back to that; it’s very, very hard, of course, to remain constantly inventive. I think that’s the big difference, that as one becomes more conscious of the process, the objects or images don’t feel as if they arrive out of nowhere. Francis Bacon often talked about the painting popping into his mind like a slide into a slide projector. It’s not quite like that, because it doesn’t pop into your mind fully formed. There are notions that one carries forward. AR	That’s interesting Anish because you don’t work your materials in the way that you did with those early pigment pieces. At what point does your intuition, your inventiveness stop and the fabrication take over? AK	I don’t see it like that actually. I think it’s always about the relation between material and the fact of the object. Even though it’s sculpture, and some of them are complex and take time to make. AR	Is there a point where you hand over what you’ve made, intellectually and physically, to someone else to make? AK	Yes, but I haven’t made it at that point. There’s an idea about making something, and then there’s the reality. You start making something: it’s the right form, or it’s not the right form; it’s the right material or not the right material; the right colour or not the right colour. One feels one’s way. The thing about the pigment pieces – and perhaps the cement pieces too – is that, notionally at least, they are conceived as a single event. They have a symmetrical, relatively straightforward geometry, and they’re possible to make within a day, two days, maybe three. With the cement pieces I had to let go of a few things: I had to let go of what I was trying to say and let the process do what it does. I’ll find a language. It’ll come. You know, it took two years to get going with the idea that one could make a machine that makes objects. GH	By doing this you bridge the gap between the invention and the fabrication – they become one and the same thing. AR	But I get the impression that with the work you are making for Paris next year [Grand Palais, Leviathan] the process of fabrication is actually one of invention. AK	In Paris, we’re trying to make an inflatable. It’s bigger than any inflatable that anyone’s ever made – it’s huge. At the moment, we’ve got fifteen tons of fabric sitting on the ground and we don’t even know how to unfold it. Nobody’s ever tried to pump something like that and get it to stand up as it should. So the day we open the show is the day we’ll know whether it’s any good or not. The risk is inherent in the way that things have to be. AR	You’ve set yourself these challenges several times. AK	It’s crazy, but you just have to go for it. It could well be that the show in Paris will be this huge fabric all over the floor. AR	It worked with Taratantara [Baltic Centre for Contemporary Art, Gateshead, UK, 1999]. AK	Very different. There we were stretching. Here we’re blowing. Air becomes one of the mediums of the sculpture. GH	In the exhibition in Mumbai, it’s the first time you’ve shown the wax and steel works in such close proximity. Can you say something about the relationship between those pieces? They achieve similar things using very different means: the steel is hard and reflective, the wax is viscous and opaque. The steel has a defined form but the world warps within it, whereas the wax is always trying to find a form. AK	I’ve made paintings for over twenty years or more. I probably have paintings from thirty years ago that I’ve never shown. The pigment pieces bring colour into the equation, and the fact that colour isn’t controllable: it tends to be messy. AR	Or to bleed, in your case. AK	Bleed, exactly. Literally bleed. Of course there are implications there which are important. And then there is the other side, which is geometric, and has a Euclidean purity about it. In a way these two opposites live together, sometimes with difficulty. One is expressive, the other isn’t. I’m really interested in the idea that colour and form confuse one another. Look at the way Donald Judd brought colour right into the space. We’ll have to see how it works in Mumbai. GH	They’re also interesting because the wax and steel works are totally dependent on the materiality, but the experience of the work is beyond their materiality: it’s between the viewer and the work rather than in the work. I guess that’s also the difference: the pigment pieces, whatever their associations, are very much themselves, aren’t they? You look at the object, and you go into the object. But with the later works, you are always thrown back on yourself. AK	I suppose the pigment pieces have a more specific cultural reference or history, whereas the later works don’t. GH	Shooting into the Corner [2008–09], which you’re showing in Mumbai, is a painting, but also a great gun, shooting red matter into a corner. It’s formal but also associative. How do you see it, and how do you want other people to see it? AK	I think good work has multiple possible readings, and the more readings the better the work probably. There is this sense that one can somehow – we all want to, or I want to anyway – write grand opera, or make works that deal with great subjects, yet somehow one can’t presume to say that this work’s about death, or that work’s about that – that way lies banality. Yet I feel a sense of certainty that work can deal with big subjects without illustrating them; and that I can let it go to places where I don’t control the meaning. That’s an important step, which is surely to do with confidence. I think it’s also to do with reaching out beyond the art world, which is something I’ve begun to feel is actually possible. GH	It would be trivial to read Shooting into the Corner literally, but it does have associations of war and violence that we can’t ignore. If you take a long view, away from the local and historic associations, these are entropic processes; the way nature balances itself. AK	True. So the other part of your earlier question, about the geometric and the informal, is also a matter of balance, of a steady state versus the entropic. With Shooting into the Corner I didn’t sit on an aeroplane or in my studio and say, ‘I’m going to make a gun, and I’m going to shoot and it’s going to mean such and such.’ It’s quite the opposite. I knew what I wanted to do with the rest of the Royal Academy show: it was about things moving and forming objects – moving arms, if you like, which formed objects. Then there was this beautiful big room and I wanted to see if I could occupy the space formally. One way was to put something in the middle of the room and shoot it into the corner. Now, shooting into the corner has immediate associations, from masturbation to something masco-feminine: Duchampian in the proper sense. And then I made the work and there were associations ranging from Pollock to Goya, with Austrian action painting in the mix – I’d first made the work for MAK, in Vienna. AR	There’s been much written about your not wanting your work to be exoticised, or be seen expressly from the viewpoint of a single cultural reference. This is your first exhibition in India. What does it mean to you to be going back and showing your work there? AK	This show in India is something we’ve been thinking of for a good ten years. It’s a curious kind of homecoming in a way. I’m slightly afraid of it, to be perfectly honest – not because I’m afraid of being judged, but there’s something wonderfully mysterious about absence. I suppose one of the reasons to show the work is to test it. I’m interested in that thing which I started with when we talked about India: whether the mystery of the work is big enough to stand up to the mystery of India. I don’t know the answer of course. And there may not be an answer.